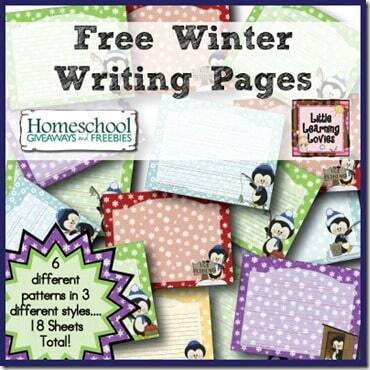 Once a month, I get to create a special, exclusive freebie for Homeschool Giveaways. Have you seen that site? It’s AMAZING all the fun new FREE stuff that gets posted over there. I highly recommend you grab a cup of coffee or tea or whatever warm, comforting thing you like to drink, and head on over there for a while to browse around. Worth every moment! And while you’re there, you might want to pick up our cute writing paper freebie. 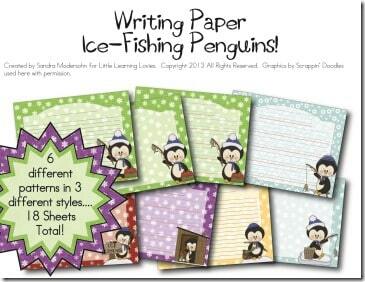 It’s 18 sheets of adorable ice-fishing penguins! Each pattern comes in blank, primary ruled and standard ruled to fit all your little learners. BIG FREE Literacy Games Pack for 2nd, 3rd and 4th grades! Workbox Wednesday–Three Day Freebie: Teddy Bear Pirates! Workbox Wednesday–Three Day Freebie–Birthday Bears!